I just realized this thread was still missing a proper look at the "FEMA photographer" credited with most of the pictures discussed here - depicting "the Ground Zero rubble and its Heroic Firefighters": Kurt Sonnenfeld. The tale woven around this enity has got to be one of the lamest in the history of 9/11 propaganda/limited-hangout efforts. It has kept 'mainstream conspiracy sites' busy for a little while - but has, thankfully, pretty much fizzled out. 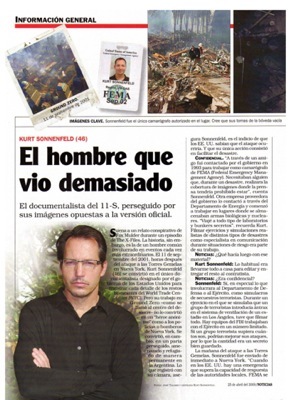 KURT SONNENFELD - aka "El Perseguido"
Kurt Sonnenfeld's script also includes a very "murky and sinister" sidestory (to make this bore of a script a bit more exciting - you know) which goes: "Kurt is wanted by the Colorado authorities, suspected of having murdered his former wife". Of course, Kurt himself is quoted as saying, basically: "I've been framed by the US authorities - because of my damning pictures of Ground Zero ! My wife committed suicide!" "9/11 Videographer Re-Charged For Wife's Shooting Death"
The whole farce should now be clear to all Cluesforum readers: as the 9/11 FAKERY FACTORY released their new batch of fake Ground Zero Rubble imagery (around 2009 or so), they needed to spin the story of a 'controversial photographer' - whose clandestinity would help explain why these never-seen-before Ground Zero were released so darn late! . Is this really a real fireman? "it looks like Viet Nam ... It looks like a movie set." he says as he steps out of the wardrobe trailer in his clean-as-a-whistle costume. Looks like Viet Nam? He looks like he was maybe born during the VN War but I'm sure this immaculate fireman has seen movie sets. "Viet Nam, just like I pictured it...collapsed skyscrapers 'n everything"
I just lost an epic dissertation on the following clip due to a brief power outage, It is very late so this remake will be more of a series of bullet points. -noone else in video has visible breath, but are dressed for cold weather. -weather report that day in New York times claimed a low temperature of 60 at night, and low humidity all day. No need for such heavy jackets, and unlikely visible breath. -Also, the civilians (presumably) mere feet from the foot of the tower seem relatively disinterested, and probably should have been evacuated anyways. I am not sure what to make of this, possibly some of the worst non-digital fakery so far? Or misused video clip not actually from 9/11? What do you guys make of this? Does anyone know where the footage came from so it can be viewed in context? Note: My apologies, I am horribly dissatisfied with this post right now, Possibly later this week I will try to rewrite my wall of text. Oh yes! I,m going to my car right now for a break. Then i,m going to save someone after my break.
" It looks just like a movie set down there " Hmmm. Here is a report of the recent funeral of "9/11 hero" Richard Nappi. I've tried to locate any earlier references to him but there don't seem to be any. I guess he was the quiet low key kind of hero. Maybe he is a real person and the 9/11 hero history was tacked on to enhance the story? 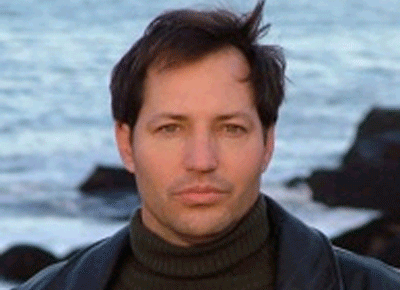 MrSinclair wrote: Maybe he is a real person and the 9/11 hero history was tacked on to enhance the story? We are told that on 9/11 Nappi was assigned to Engine 7 in lower Manhattan. Funny thing, "engine 7" is the same phony unit to which the "Naudet brothers" were attached. I think it is pretty safe to argue that there never was a "Richard Nappi". At most there has been an actor who impersonated him and who can probably be seen in one scene or the other in that nauseating, fake, De Niro-sponsored movie. 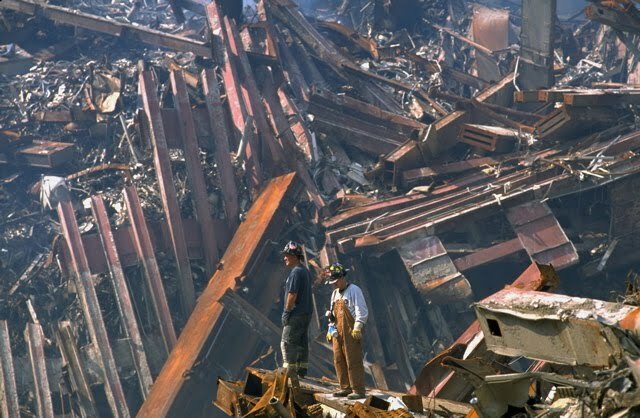 For the sheer purpose of the continuing "reminders" that 9/11 requires in the media, this character name and a couple of pictures must have been brought to surface now to be served into the "news". Why not? After all, they created them, and they can "kill off" them. I did some searching on Nappi and he doesn't seem to really exist prior to his recent death. 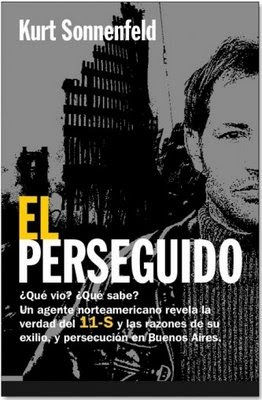 Like so much of the narrative assembled around 9/11 he and his story seems to lack a sort of resonance that a true story would have. Many of these heroes seem to remain unknown and hidden away until deployed when suddenly they are presented in a sense as having been there all along. Your point is well taken. If Nappi were real and known to be a 9/11 hero where are the previous news articles or feature stories recognizing him as such? How could he remain unmentioned online anywhere for his heroic acts that day? Why was he not sought out, interviewed and profiled by local and school papers in his area? Wouldn't he be a Marshall in local parades or speaking at high schools to encourage the children? No there is none of that, just some recent media content with a self-fulfilling air of of authenticity. I'm sure you are right Nohno, he is no more real than the absurd Vietnam vet fireman who ranks as my new favorite comedic bit-player in this melodrama. My observations on those oh so sacred firefighting heroes is that they look like criminals. Their photos remind me of mugshots. Many of them are exceptionally scruffy and look so unfit (as in unhealthy).I have never seen a British firefighter looking overweight or unkempt. Don't these guys have to undergo medicals or have smartness guidelines? They look like extras from a gangster movie,extras being the operative word. Also, whenever they are shown in the many videos of the event they aren't doing anything, either standing or strolling about, waiting for their cues no doubt. EDIT: Ah.. we have found ourselves a ( C ) picture!! Exposure to 'jet fuel' made those fire fighters shrink? What's wrong with this guy's foot? It's twisted at such an awkward angle. His leg looks broken at the knee as well. He has amazing balance to be hobbling around on just one good leg! Good Old Engine 7! The MOST convenient firehouse in all New York for the events of 911 to unfold, LOTS of deception in that building AND it shows up in scores of amateur footage as well as Avery's Docudrama! Last edited by lux on Sat May 26, 2012 1:49 am, edited 1 time in total. Seagram's Seven Crown, otherwise known as Seagram's Seven, is a blended American whiskey produced by Diageo under the Seagram name. Seagram's beverage division was acquired by Diageo, Pernod, and The Coca-Cola Company in 2000. Seagram's Seven is typically consumed in combination with a non-alcoholic beverage. Popular mixers include cola and lemon-lime. Seagram's Seven with 7up is known as a 7 and 7. Seagram's Seven has an ABV of 40%.